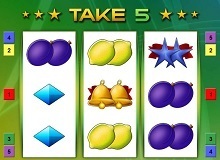 Take 5 is a simple but captivating slot by Bally Wulff developers. This classic game comes with 5 paylines, 3 reels, and 3 rows. The well-designed game with lucrative payouts is the ideal fun way to pass your free time. The few paylines makes it easy to play and win. Players do not have to be stuck behind their desktops to play the game since it is optimized on iOS and Android mobile devices. This slot machine is designed with a retro look juiced up with traditional fruity icons. The slot is perfectly presentable and ideal for players who love simple but classic games. This game is mostly ideal for high rollers since the betting range is quite high. The minimum betting amount when playing Take 5 for real money is 50 coins while the maximum is 50,000 coins. Players are easily able to adjust their bets from the user interface. Click the blue dollar sign to open the paytable where you learn about the values of different icons and rules of the game. The bet button allows one to change their bets freely. The Max Bet button makes it easy for the player to place the maximum stake possible automatically. Press the Spin button to begin the gameplay. There is an autoplay option where players can spin the reels automatically for their desired number of times. Take 5 slot does not have any special rules. The player is only supposed to turn the reels and land three or more identical icons on a betting line. The winning combination will only be counted when it is formed from left to right. Different icons in the casino online game reward differently when they form a winning combo. It only has 8 symbols which give players better-winning chances. Symbols present during the gameplay are blue diamonds, cherries, lemons, plums, oranges, golden bells, blue stars and red 777. Red 777 is the highest paying icon in the game, and it awards the jackpot amount. When this icon appears on an entire bet line, the player is awarded a maximum payout of 5,000,000 coins. The RTP is 95.98%. You will get tow bonus features when playing Take 5 slot machine online. The bonus rounds help one to win more. The slot does not come with any scatter or wild symbol, but it offers higher winning odds and simple gameplay. Below are the available bonus features which make it outstanding from other classic slots. Win RepeaterThis is the main bonus round in Take 5 casino online slot. The feature is unlocked when you fill all the reels with similar icons. One is taken to a wheel of fortune with 5 segments. Spin the wheel and if you land on any of the four segments labelled ‘Win’, you continue to spin. You will be rewarded with the maximum prize every time you land on the ‘Win’ segment. The player can win as much as 25,000,000 coins during the bonus round. The round finishes when one lands on the segment written ‘End’ or after spinning 5 times. A Lander Gamble – A gambler is shown several prizes in a lander. If one hits the gamble button, they can either land on the lower or higher step ladder. The player can continue to gamble until they get to the top and win the top prize of 15,000 credits. If one hits the bottom step, they lose their wins and get 0 credits. A Card Gamble – In this mini-game, the gambler is asked to guess if the turned playing card is black or red. Their wins double when they give the correct guess. The maximum amount you can win during the gamble game is 15,000 credits. You lose all your prizes when your guess is incorrect. This slot machine offers players with nice payouts and hours of entertainment. Gamers playing Take 5 free version are given 50 complimentary coins. It is therefore not possible to play the demo version with the maximum bet. The slot, however, offers more than a standard game. It is easy for beginners to learn and the lucrative bonus round showers players with prizes. 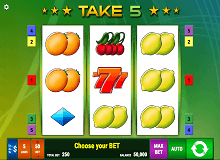 The two gambling features and vivid colours used in the design also make the casino online game more captivating.